Warehousing Equipment proudly presents its new Powered Turnmate electric trolleys. 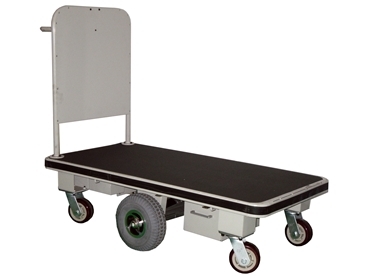 Home > Warehousing Equipment proudly presents its new Powered Turnmate electric trolleys. The Powered Turnmate electric trolleys are proudly released by Warehousing Equipment , as part of the fast growing Powered to Go Range. Allowing it to be used in the narrowest of aisles in warehouse and small offices, the key feature of Powered Turnmate electric trolleys is it pivots on its central wheels. These electric trolleys are suitable for a variety of applications with a large capacity of 450kg and a deck size of 1200 x 600mm, and now Warehousing Equipment also provides powered product solutions for existing trolleys.